But now that it’s on Netflix, we’ve watched it countless times. It’s entertaining, and a definite step up from the inane “based on the movie” shows on Netflix like Home or Angry Birds. 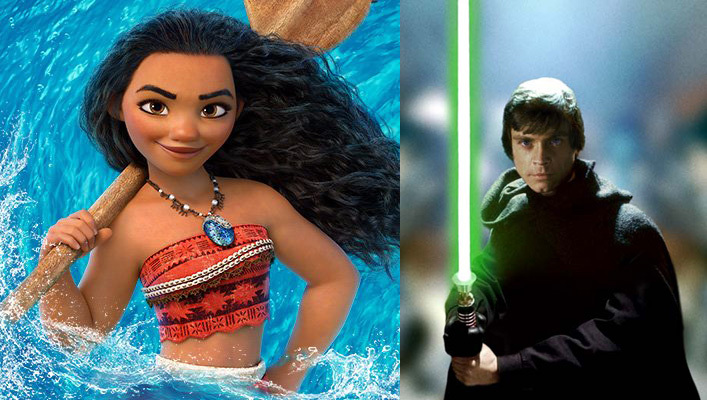 In any case, after several watchings of Moana, I realized that there were quite a few similarities with one of the best movies from my childhood, Star Wars: A New Hope. Sure, much of the similarities are due to both being based upon Joseph Campbell’s Hero Journey, but I think it goes further than that. Moana has unusual powers (coming from the sea rather than the Force). She’s held back from going out into the world by her parents. She eventually leaves because of tragedy, learning much on the way. And, of course, she saves the day. They each have a McGuffin that turns out to be very important, the Heart of Te Fiti and the Death Star plans. Cocky and irreverent. Seems not to believe in anyone but himself. Leaves before the final battle to save his own skin, but comes back at the end to help Moana finish the job. Believed by all but Moana to be crazy, but is the only one that truly understands what’s going on, or the powers being used. Comes back in a spectral form after her death to help inspire Moana and point her the right way. Bumbles around, but inadvertently helpful at times. Ok, I’m reaching here, but C3PO needs a sidekick, and Pua is the right stature. The big bad. Darkly colored with terrifying powers. Even turns good in the end! So, that’s it. What do you think? Did I miss anything?